Pablo Rabanal is the founder and CEO of Reclamador. A native of Madrid, Pablo (41) describes himself as a for-profit Robin Hood. Pablo holds a Bachelor’s degree in Business Administration from ICADE and Marquette University Wisconsin, as well as Masters Degrees in Audiovisual Management (MEGA) and Internet Business (MIB-ISDI). 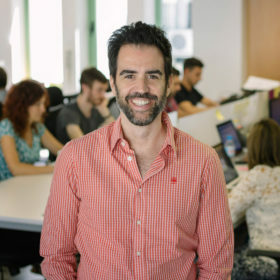 Since graduating in 1999, Pablo has worked in a diverse array of companies, including IBM, BNP Paribas, Esicma – a film production and distribution company (as CEO), Bwin Retail – a retail betting company (as CEO), O2C World – a real-time hotel reservation firm (as Partner), and Future Films (Tax Advisor). On average, every year, 1.5 million travelers in Spain are victims of delayed or cancelled flights, 3.5 million suffer from illegal bank fees and thousands of individuals from wrongful charges by their phone companies. Due to the lack of knowledge of consumer protection laws, heavy paperwork and expenses involved, only a small percentage file for claims against the corporates. Determined to see the victory of David over Goliath, Reclamador operates an online platform that effectively manages the end-to-end process of filing claims against large corporates on behalf of customers, on a ‘no-win, no-fees’ basis. The company’s user-friendly platform allows customers to file a claim in less than five minutes, after which Reclamador handles the entire process. With a success rate of over 90%, Reclamador is a pioneer and leader in the US$10 billion Spanish claims market. Today, the company operates in all the provinces in Spain, and has helped 75,000 individuals (over 12% of the total mercantile court proceedings in the country).